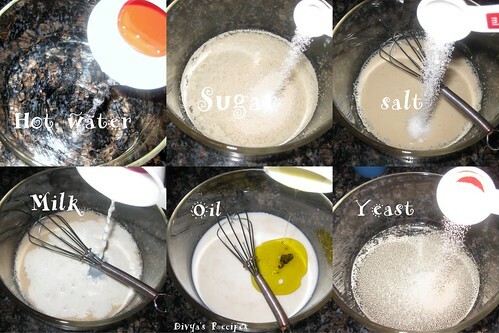 Boil the water first in a wide vessel and keep aside.Now add milk,oil,sugar,salt to boiled water and mix well till sugar dissolves.Now add yeast to the milk oil solution. 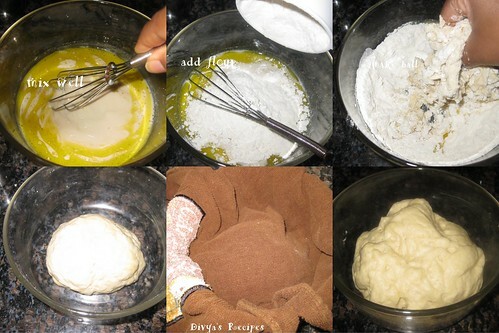 Add the flour and gather to get a smooth dough.No need to knead so much. Keep covered with a wet cloth till an hour or 2 hours. After an hours it will be doubled in size. 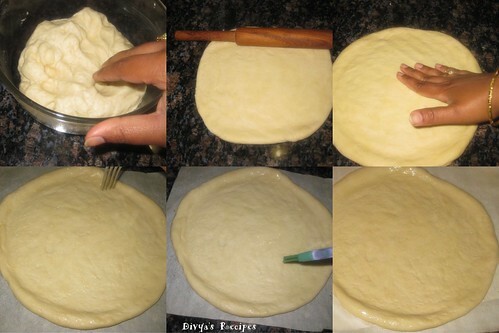 Again gather to make a smooth pliable dough,just rolled using rolling pin (adjust the thickness and roll out to a single base) and folded the ends . (You can prick the base with fork to make sure of getting cooked every where,but i forgot to do so,still mine got cooked fine. )Apply olive oil to pizza . Arrange the toppings as desired and add the grated cheese to cover the toppings. Grease a pizza pan,with olive oil and transfer the prepared pizza to it, U don't have any pan so u lined u r oven tray with aluminum foil to bake the pizza. Preheat the oven for (210 C / 410 F) and bake for 12-15 mins,till the base and the cheese turns golden brown. 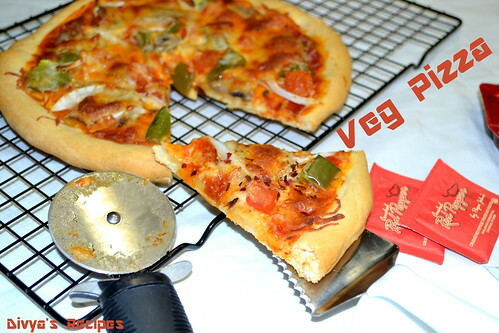 Cut the pizza with pizza cutter/knife and make wedges and enjoy hot and yummy pizza. Pizza looks simply outstanding. Wonderfully prepared. The Pizza looks yummy. Love the detailed pics and descriptions. 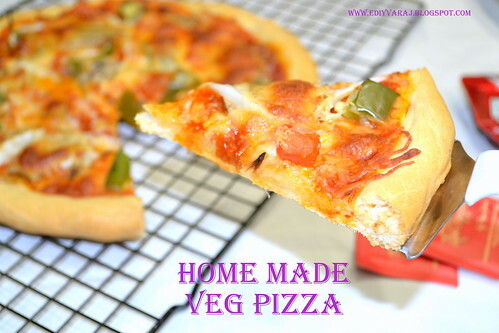 wow.. perfect home made pizza..
pizza looks delicious and inviting. 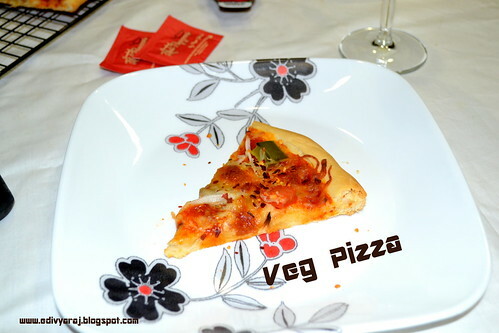 My kind of pizza, can have it happily anytime. 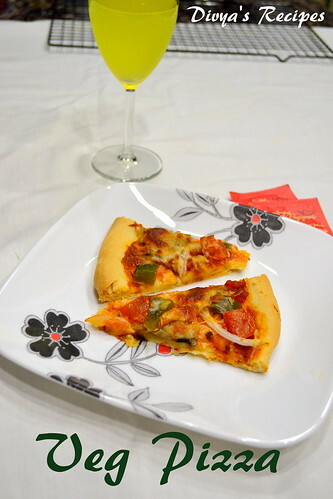 Very yummy and inviting home made pizza. My all time favorite... my mouth is watering here.Perfectly made. What a yummy and tempting pizza! Presented it very neatly Divya. Sounds delicious Divya. Love your pictorial presentation dear. Very well made pizza .. looks like it has been delivered from Pizza hut ! 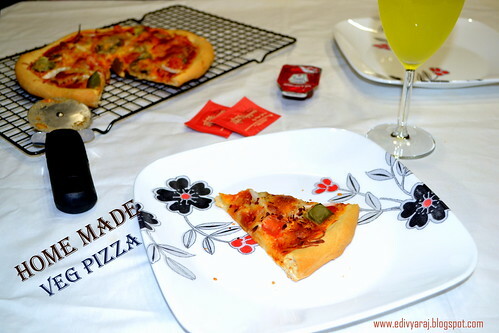 Looks perfect with color and flavor DIvya..Yum! 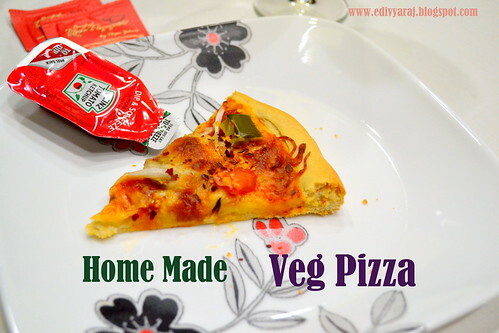 I too like home made pizza very much. Yours look absolutely perfect and delicious. No more pizza from the store. This looks fabulous! 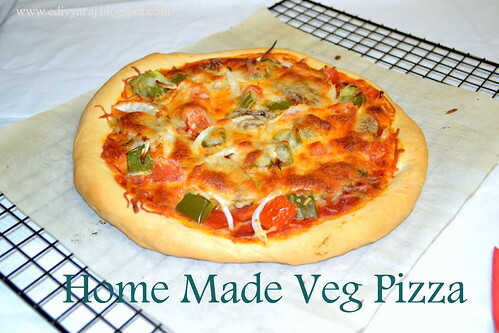 veggie pizza, sound healthy and good!